(SPOT.ph) Hotels make for great staycation places—especially with their cozy rooms, cool swimming pools, and excellent room service if you like to take things up a notch. Another reason why hotels are great? Their buffet offerings! 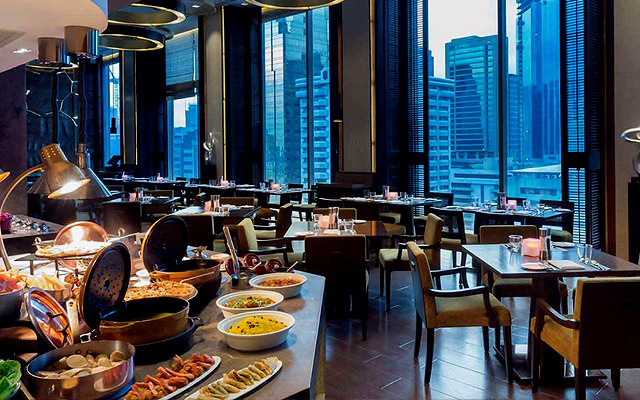 And while there’s no shortage of buffets all around the Metro (after all, they’ve got everything from Korean barbecue and breakfast staples to amazing desserts), we’re making your next fancy eat-all-you-can scout easier by rounding up the best hotel buffets we can find in Manila. 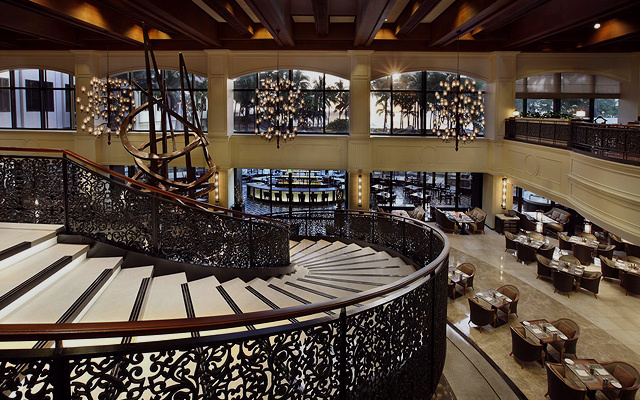 It’s hard to meet anyone who hasn’t tried dining at Sofitel’s Spiral and didn’t enjoy their experience. There’s something for everyone here with the buffet’s 21 different stations, or what they like to call “dining ateliers.” They’ve got everything from French pastries, North Indian cuisine, Chinese, and sushi to Thai and Korean delicacies—even their own ice creamery and chocolaterie. On certain days, they even have specials like the Sunday Cheese Room for a curated wine-and-cheese pairing session, or the Thursday Butcher’s Choice, which features the freshest, most premium meats in the market. Fun fact: National Artist Jinggoy Buensuceso came up with the earthy elements of Marco Polo’s Cucina. The hotel restaurant’s minimalist interiors serve as the perfect setting for Asian and Continental cuisines lying in wait. There are stations for refreshing salads, freshly baked breads, hearty pastas, Filipino and Japanese favorites, desserts, and of course Spanish specialties like a classic paella. Cucina has your cravings covered from breakfast all the way to dinner. 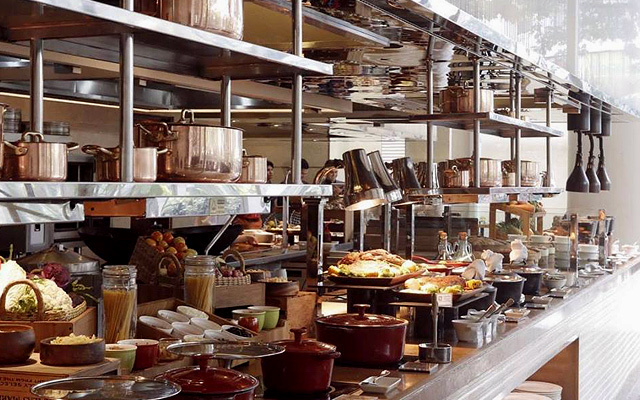 Plus, you can see how everything is prepared with the buffet’s interactive open kitchen! Cucina is at 24/F Sky Lobby, Marco Polo Hotel, Meralco Avenue and Sapphire Street, Ortigas Center, Pasig City. For reservations, contact 720-7777. 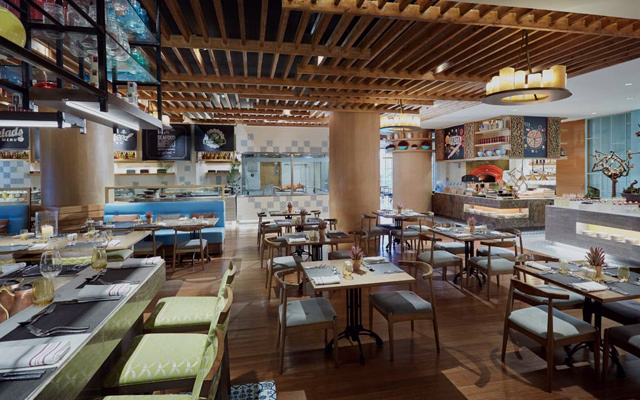 At first glance, you’d think that Marriott Café’s marbled interiors definitely make the place one cut above the usual buffets you visit, and their food menu takes things even further. 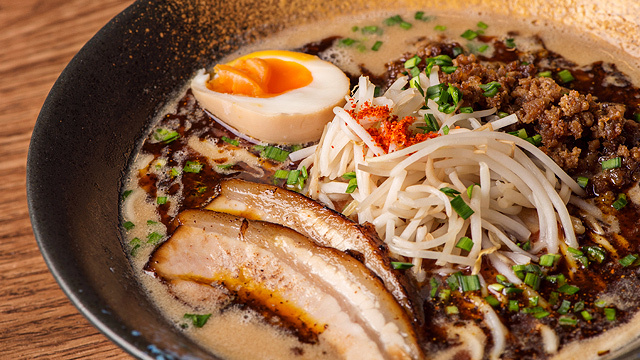 They offer a wide variety of eat-all-you-can dishes from breakfast to dinner, highlighting some awesome local delicacies and treats from all over the world. Depending on the season, you can try their different specialty items from their seafood menu, and if you’re lucky, you can even catch their unlimited lobster promos! 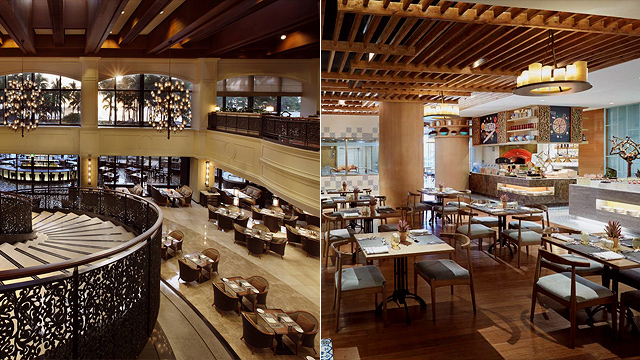 Marriott Café is at G/F Marriott Hotel Manila 2 Resorts Drive, Pasay City. For reservations, contact 988-9999. When it comes to a great and satisfying dim sum buffet, one of the Metro’s best-kept secrets is Makati Shangri-La’s Shang Palace. They have an all-you-can-eat dim sum menu with over 40 different Chinese dishes to choose from. (And since it’s a buffet, why not see if you can try them all?) Indulge in all the buffet’s dumplings, rice rolls, and buns you fancy. Pro tip: Don’t skip their savory deep-fried taro puffs that’ll leave you wanting more. 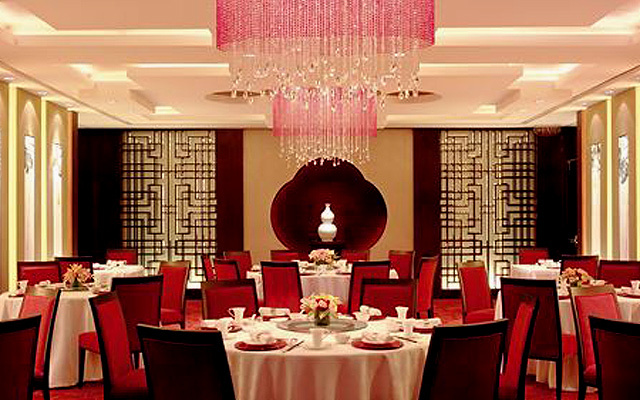 Shang Palace is at 2/F Makati Shangri-La Hotel, Ayala Avenue corner Makati Avenue, Makati City. For reservations, contact ) 814-2580. 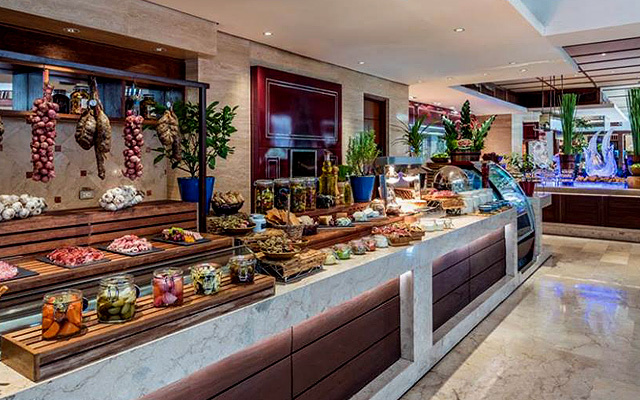 The Pantry at Dusit Thani Manila is big on their farm-to-table concept, so you can be sure every ingredient that goes into the buffet’s dishes are fresh and locally sourced. 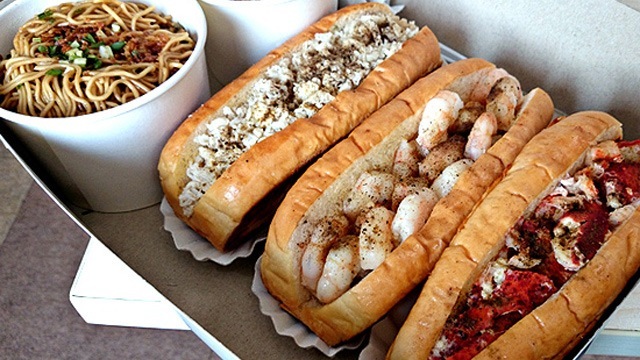 Their specialty cuisines include Indian, Filipino, Italian, and Asian. If you come for Sunday brunch, you even get access to the wine, craft beer, and a cool mimosa bar. One of the best parts about The Pantry? They always have a whole lechon waiting! The Pantry is at Dusit Thani Manila, Ayala Center, Makati City. For reservations, contact 238-8888. 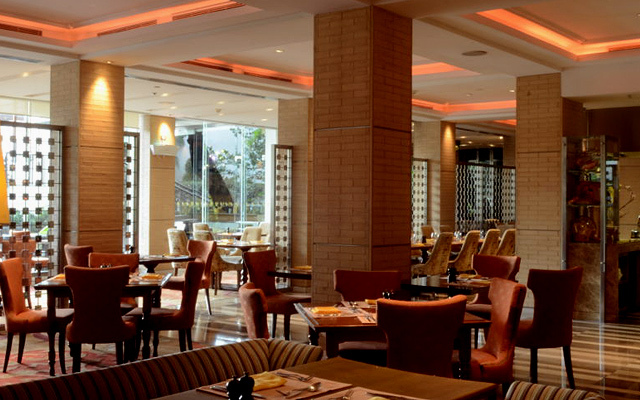 Café Ilang-Ilang takes your regular buffet up a notch with its homey ambience and elegant interiors. But, of course, the main event would have to be their extensive menu that’ll give you a little taste of every corner of the world. Their breakfast and lunch offers are pretty set, but if you really want a treat, you’ll want to save up for their dinner buffets, which highlight different delicious dishes that fall under one theme—yup, there’s a different theme every night of the week. They’ve got Monday and Sunday International Buffet (P2,675/head), Tuesday Mediterranean Night (P2,675/head), Wednesday Asian Night (P2,675/head), Thursday Surf And Turf Night (P3,270/head), Friday Seafood Night (P3,270/head), and Saturday American Night (P3,270/head). We don’t know about you but we’re reserving our tables, pronto. Café Ilang-Ilang is at Manila Hotel Tent, 1 Rizal Park, Ermita, Manila. For reservations, contact 527-0011. 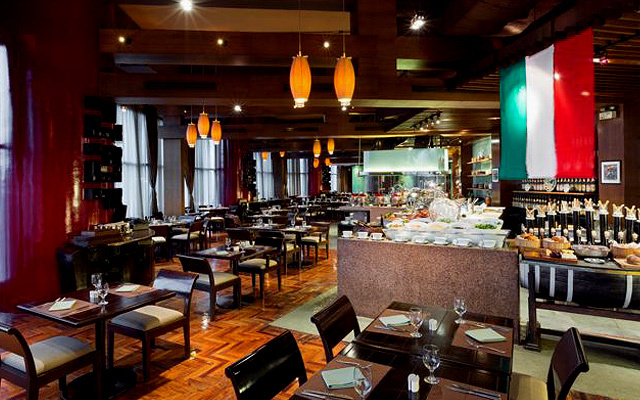 Escolta at The Peninsula Manila is known for their buffet that features live-cooking stations. This way, you can watch the chefs create their pastas, hand-rolled sushi, freshly carved meats, and a lot more. They even have their own artisanal ice-cream station as well as a special Filipino station that puts farm-to-table dishes front and center. And if you come for Sunday brunch, there’s also an option to include free-flowing craft beer and wine (P3,600/head) or champagne (P4,300) with your buffet. Escolta is at G/F The Peninsula Manila, Ayala Avenue corner Makati Avenue, Makati City. For reservations, contact 887-2888. If you’re in the mood for Middle Eastern, European, Indian, Chinese, or Filipino, definitely consider putting Spectrum on top of your list. They’re known for their open-kitchen concept, in which their resident chefs whip up every dish using various cooking styles and techniques. For special occasions (on your next birthday perhaps? ), avail of their drinks upgrade so you can pair their international dishes with fine wines from their in-house sommelier’s cellar. Spectrum is at G/F Fairmont Makati, 1 Raffles Drive corner Makati Avenue, Makati City. For reservations, contact 795-1840. It’s hard to miss the Seven Corners buffet—the whole buffet is spread out on one long table, so you’ll definitely be able to catch every single item they’ve got on offer. Seven Corners is mostly known for their juicy steaks and tandoori dishes, but they also have great American and Asian cuisines to complete their selection. They also have stations for noodles, pizza, and even an array of desserts (plus a chocolate fountain!) that you can only try to resist. Seven Corners is at 3/F Crowne Plaza, Ortigas Avenue corner Asian Development Bank Avenue, Ortigas Center, Quezon City. For reservations, contact 633-7222. Nobu has made their name as one of the most premium Japanese restaurants in the country, and luckily they have an eat-all-you-can Sunday brunch buffet so you can try a little bit of everything and more. Although their cuisine is distinctly Japanese, there are some Peruvian- and Filipino-inspired dishes mixed in with the whole selection to spice things up. The whole place comes packed with different kinds of sushi and sashimi and even has its own carving station and yakitori grill. Don’t miss their dessert station, which highlights Japanese-inspired flavors like black sesame and of course, matcha. 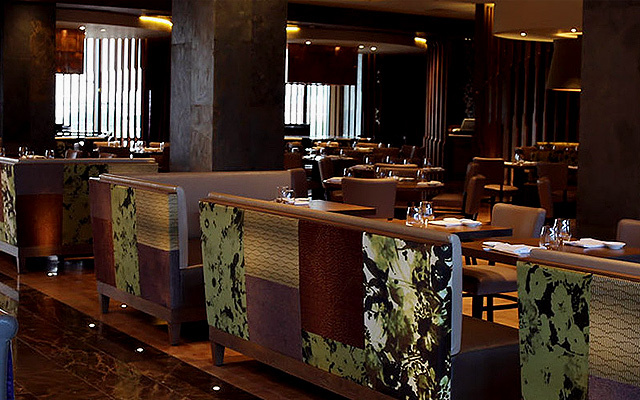 Nobu Manila Restaurant is at Level 1 Nobu North Tower, City of Dreams Manila, Aseana Avenue, Parañaque City. For reservations, contact 800-8080.